A PDF file of the webinar [59MB] is available here. A state-level policy, management and science approach to build support to address ocean acidification: lessons learned after 5+ years of stakeholder collaboration in Washington state. Presented by Martha Kongsgaard, Chair of the Marine Resources Advisory Council; Bill Dewey, Taylor Shellfish; Kirsten Feifel, Washington State Dept. of Natural Resources, Aquatics; Terrie Klinger and Jan Newton, Washington Ocean Acidification Center and Richard Feely, NOAA Pacific Marine Environmental Laboratory. Chad Bowechop, manager, Makah Tribe Office of Marine Affairs has also been invited. 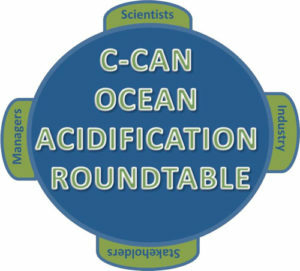 This webinar will be hosted by Jan Newton, Washington Ocean Acidification Center and Shallin Busch, NOAA Ocean Acidification Program and Northwest Fisheries Science Center. Abstract: Speakers will discuss the lessons learned on translating ocean acidification science into policy action in Washington state, working with state and local agency leaders over the last five years through their Blue Ribbon Panel on Ocean Acidification. Participants will hear perspectives from industry, science, policy and management; panelists will offer reflections for other states as they look at how they may also approach this work in their respective regions. There will also be a brief overview of critical new scientific findings in Washington’s coastal and inland waters. Washington presents a valuable case learning opportunity on how to turn ocean acidification research into policy action. In this C-CAN webinar, Washington state policy and management experts, industry/resource users and scientists will reflect on lessons learned in the five years since the governor-appointed Blue Ribbon Panel on Ocean Acidification was formed as the state’s coordinated response to ocean acidification. The focus of this panel will be on the unique approach Washington took, with the threats to their tribes, shellfish industry, and other resource users serving as the central organizing principle; the determination of what questions to ask in the research stemming from an understanding of what answers were sought after by each stakeholder group; and the evolution of how the different interests represented during the original 2012 Blue Ribbon Panel and subsequent 2017 Marine Resources Advisory Council/Five-year Addendum worked together. Whether you are a scientist, policy or management expert or resource user, and whether your region may be just beginning to learn about what resources may be vulnerable to ocean acidification or are in the throes of research, there will be valuable takeaways as the speakers discuss how the state’s Marine Resources Advisory Council identified and prioritized different paths to action, from kelp bed growth to climate mitigation. They will also take a critical look at what elements of their approach successfully served to build more support and prioritization for ocean acidification and adaptation strategies in their region and where they fell short of expectations. The latest scientific findings on ocean acidification drivers in Washington’s coastal and inland waters, and future planned scientific collaboration, will also be summarized. Several speakers are members of Washington’s State’s Marine Resources Advisory Council, a governor-appointed board responsible for maintaining a sustainable coordinated focus on ocean acidification; advising and working with the Washington Ocean Acidification Center on the effects and sources of ocean acidification; delivering recommendations to the Governor and Legislature on ocean acidification; seeking public and private funding resources to support the Council’s recommendations; and assisting in conducting public education activities regarding ocean acidification. The five-year update report can be found at www.OAinWA.org. After registering you will receive a confirmation email containing information about joining the Webinar. Following the presentation there will be a few short informational announcements relevant to the C-CAN community. Please forward this invitation to interested colleagues. We look forward to seeing you at this event! 1. Plan to log into the Webinar at least 5 minutes before the scheduled start time. GoToWebinar is continually upgrading their software. We want to be sure that your computer has time to access any upgrades and you are able to access the presentation and meeting.